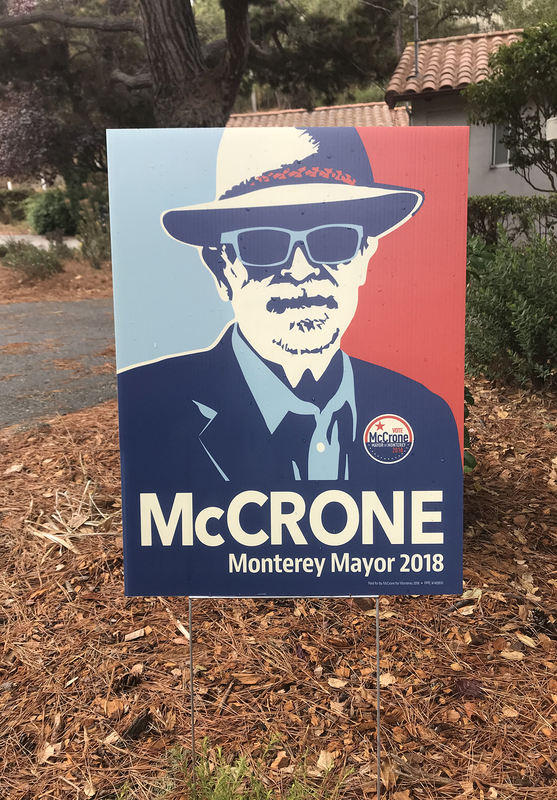 The prize for the best campaign sign of the season goes, by a landslide, to Monterey mayoral candidate Bill McCrone. It contains several elements of good art, including strong design a la Shepard Fairey and plenty of ambiguity. Is he channeling his inner gangster, or perhaps making a commentary on the forces he has been fighting for several years now? In case you’ve forgotten, McCrone is the retired lawyer and former Monterey planning commissioner who invested countless hours into researching the lease structure of Fisherman’s Wharf. His conclusion was that sweetheart leases awarded decades ago when the Monterey City Council was a real good-old-boys club are still being used to enrich the few at the expense of the many, as in the taxpayers. McCrone wrote several pieces on the subject for my former blog, the Monterey Bay Partisan. The blog is offline these days but I’m working on resurrecting it so folks can read his excellent work on the wharf issues as well as some compelling, if I do say so myself, coverage of Cal Am’s successful effort to wring every dollar out of its customers over the years. By the way, McCrone is running against popular incumbent Clyde Roberson, the heavy favorite. By the way, Roberson patched things up with many Peninsula good-government types by coming out in support of Measure J, the Cal Am takeover initiative. More on Cal Am in a minute. I’m still trying to figure out exactly what happened at the Carmel City Council meeting Tuesday. It is complicated as heck but let me see if I can streamline it as much as possible so folks can follow along as this silly saga continues. The council was there to meet in closed session to decide whether to appeal my courtroom victory over the city’s failure to understand California open records law. I had written several pieces challenging key elements of City Attorney Glen Mozingo’s resume’. I won’t bore you with those details but you can click a link below and see those articles. Let’s just say that Mr. Mozingo isn’t precisely who he says he is. My public records lawsuit involved my effort to see supplemental paperwork Mozingo provide to the City Council in an attempt to back up some of the fishy claims he made on his resume’. Anyway, the council chose in closed session Tuesday not to appeal the judge’s decision and instead to turn over the paperwork in the near future. But when I and others asked for a breakdown of the vote, Mozingo assistant Jon Giffen said the law doesn’t allow that. The trouble is the law not only allows that, it requires it. California’s public record law says that when a government body votes in closed session whether to appeal a legal decision, the vote of each government body member must be disclosed. Some predictions: there will be more confusion, more litigation, and Mozingo will resign rather than turn over the paperwork he showed the council. As the council moved onto unrelated business, I drifted off into the evening to write my account of the meeting. Things got stranger after I left. Retired dentist Hugo Ferlito and City Council candidate Jeff Baron pressed the issue and Ferlito found a copy of the applicable regulation requiring disclosure of the vote. He read it to the council and all involved, then took turns reading it online. A fair amount of scurrying ensued. The council plus lawyers Giffen and Mozingo retreated into another closed session, with three members – Steve Dallas, Carolyn Hardy and Carrie Theiss – convening for a little closed-door meeting of their own within a closed-door meeting. State law says they can’t do that, but state law apparently doesn’t always apply in Carmel. Eventually they all emerged and Giffen offered some explanation and then there was a vote. But what they were voting on was not clear to many in the room and it remains unclear a day later. It appeared to NOT be a vote on the appeal issue but instead a vote on whether the council agreed with Giffen’s interpretation about the open meetings law not requiring disclosure of the previous vote. But it could have been the other way around. The vote passed, 4-1, with Council Member Jan Reimers joining the aforementioned trio in voting yes and Bobby Richards voting no. Confusing the issue, Richards was the least likely of all the members to want to appeal the ruling, so who knows? Richard said Thursday that he is not able to comment on the vote. The city administrator’s office said the mayor has provided the Carmel Pine Cone with a clarifying statement, drafted by the lawyers, so maybe things will make more sense tomorrow. Or not. Who voted which way on the appeal matters for a couple of reasons. First, city councils need to follow the law. Second, transparency is almost always better than secrecy. Third, Dallas, Hardy and Theiss are currently up for re-election. Many Carmel voters would like to know which of them, if any, voted to spend more taxpayer money fighting a losing cause to protect a city attorney who exaggerated his experience while seeking the job. Some predictions. There will be more confusion, more litigation, and Mozingo will resign rather than turn over the paperwork he showed the council. Four years ago, when Cal Am used an avalanche of deceptive advertising to beat back a public takeover campaign, it spent about $2.5 million. It outspent the opposition by nearly 50 to 1 and won the vote by a margin of 55-45. Now the big utility faces another ballot measure, Measure J on the November ballot, that would require a feasibility study on the wisdom of a public takeover. So far, according to the most campaign disclosure, Cal Am has put nearly $1 million into the No on J campaign. Bankrolled by your money, Cal Am has plenty more where that came from. With absentee ballots going out any day now, expect another flood of ads about Cal Am’s wonderfulness and government’s wretchedness. I suspect Cal Am officials truly understand that they have a bigger challenge this time. First off, they have raised their rates over and over and over since the previous vote, to the point that we now have the most expensive water in the country. Cal Am quibbles with the math but not well. Secondly, the Public Water Now organization promoting the ballot measure has grown from a relative handful of environmentalists and reformers to a much larger group dominated by accomplished Peninsula residents of some means. The list of contributors to the Yes on J campaign is full of retired engineers, accountants, businesspeople and others who likely would retire soon if they were sure they could still afford their water bills. Have something to say about this story? Send us a letter or post a comment below. I almost want the Carmel City Council to continue to act like clowns— just to continue to read your succinct but funny accounts of their foolish hijinks. Thanks. The next day, Mayor Pro Tem Carrie Theis read a statement, declaring that “in light of recent libelous” comments challenging Mozingo’s resume, the city attorney had voluntarily shared the documents with them. Carmel Mayor Steve Dallas has told constituents that the City Council is comfortable with most of the representations made on Mozingo’s resumé, but not the claim of a Congressional Gold Medal. Nonetheless, the council declared in June that they had found his application paperwork to be completely accurate. Royal, you have clearly jumped to conclusions and misstated the facts about what went on at the recent City Council meeting. The mayor called for a brief recess (after you had departed the chamber) for the sake of a bathroom break. Several of us took advantage of the opportunity. We did not go into a second closed session. If we had, it would have been announced and all five council members would have adjourned to a meeting room, not the bathroom. Mr. Giffen had also departed City Hall. Staff took the break as the opportunity to locate the appropriate Government Code section that governs reporting out a vote that was taken in closed session and the error was rectified. Too bad you didn’t stick around and too bad you didn’t review the archived video to actually see what had transpired. Much of what you write is conjecture and innuendo, based on rumor. What readers you have take some of the loosely thrown out stuff as being factual. Carolyn: Why don’t you tell us what the motion was on the appeal issue and how each council member voted. Mr. Mozingo apparently chose to allow you to do so but confusion remains over what motion the council was voting on. Surely Mr. Mozingo would allow you to clarify. Royal, as we discussed in private email, the statement Jon Giff made was the Council’s statement out of closed session and it was published in your favorite weekly paper The Carmel Pine Cone on page 43A. The vote was 4:1 in favor not to appeal the decision, pending receipt of the Court’s order, with Mr. Richards dissenting to the statement.